THE STORY - Five years, eight months, 12 days and counting -- that's how long Debbie Ocean has been devising the biggest heist of her life. She knows what it's going to take -- a team of the best people in the field, starting with her partner-in-crime Lou Miller. Together, they recruit a crew of specialists, including jeweler Amita, street con Constance, suburban mom Tammy, hacker Nine Ball, and fashion designer Rose. Their target -- a necklace that's worth more than $150 million. THE GOOD - A stellar female ensemble lay the groundwork for a truly pleasing theater experience, giving us plenty of fun and thrill to go along with the heist onscreen. Hathaway and Blanchett are our star standouts. ​Perhaps not as revolutionary as it may evoke, “Ocean’s 8” is a delightful showcase of an all-female heist film so fitting for the leap into summer blockbuster territory; and possibly the most enjoyable time in a theater, as of late. It's the season of kicking back and indulging in tasteful fun, and Gary Ross’ latest fearlessly relishes in the fact. It's not without its minor trips in early pace and lack of supporting character motivations, but it still finds the sweet middle where it parades in the stylish criminal flare we always want out of these films. Having just been released from a five-year sentence, career criminal Debbie (Sandra Bullock), sister of notorious con artist Danny Ocean of the previous franchise films, has been planning her biggest caper yet; assembling a crew to steal the Cartier Toussaint Necklace off the neck of movie starlet Daphne Kluger (Anne Hathaway) at New York City’s Met Gala. Sitting in prison all those years, Debbie vows she's been reformed and just wants to “live the simple life, pay my bills,” but she’s clearly eyeing a $150 million prize for the win. It's partly to spite her ex, Claude Becker (Richard Armitage), who ratted her out in the first place, but mostly due to her Ocean family lineage of succeeding just because they can. Gary Ross and Olivia Milch give the script a fully rounded Debbie and a backbone of her well-organized scheme. It gives a ton of screen time to Hathaway, Bullock, and Blanchett as they establish their own bridges of wit and character execution exceptionally. With a producing credit tied to the film, Steven Soderbergh’s prior heist magic is more than realized through the swift formation of an ideal, and very unflinching, feminine interpretation. The gender-flipped narrative plays like a well-choreographed dance, giving its leading ladies all something to work with to keep things on a systematic flow. Where it meanders a bit to get the set up running, it quickly makes up for in its exuberant second act. Seeing these ladies plan their biggest heist is like fabulous clockwork. The cast power is reason enough to convince a moviegoer as it foresees an enjoyable time with not only the mechanics of the thievery but also their playful workmanship. Each actress brings something to marvel at. Cate Blanchett is extraordinary as Lou, a close confidante to Debbie, and who we first meet to be a vodka-diluting aficionado, all the while owning the sharpest of wardrobe changes. Hathaway nearly steals every one of her scenes as the caricature of a modern starlet who actually deserves more kudos than we think. Sarah Paulson’s Tammy is cleverly wonderful as a working mom who's quite the con business but is struggling to cut ties on the down low. Rihanna’s Nine Ball needs no self-proof, as she's easily one of the best hackers on the east coast. The charismatic Awkwafina is our pickpocket professional, Constance. They lock in some help from jewelry technician Amita (Mindy Kaling), as well as having the fashion designer, Rose Weil (Helena Bonham Carter), dress Daphne for the evening to close in on the necklace. 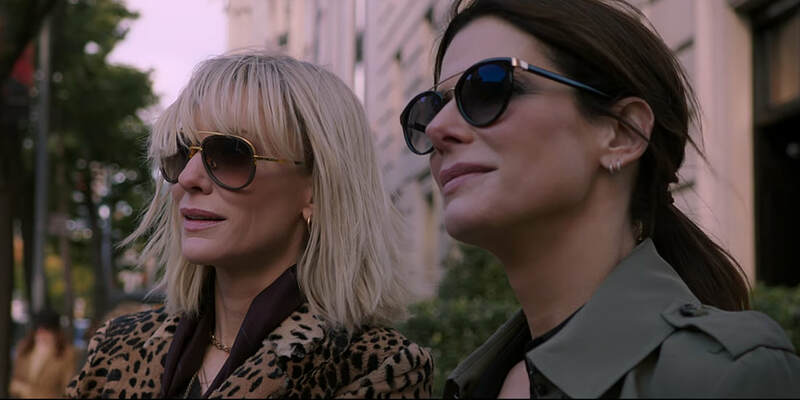 The costume design and editing, paired with Eigil Bryld’s clear-cut cinematography, helps “Ocean's 8” spin itself full form to be a triumphant heist that impresses. What works so well about “Ocean's 8” is how the characters all bounce off the same points of motivation and quick sly. Danny Ocean made a name for himself and smooth-talked his way into forming an effective team. He was essentially the foundation of the house, perfecting his reach in every way imaginable. Coming from a family of criminals, Debbie sets out to draw her own dream heist, building it from the ground up with some memorable female characters who are as willing as her to do the seemingly impossible of things. As we see Debbie and Lou ignite the fires, we can't help but wish we got more from the other women introduced. While the film does a balancing act of weaving the plot at play, it just barely escapes an emotional latch to the women behind the heist artistry. When it comes down to it, “Ocean's 8” is truly the kickass showpiece it set out to be; not too flashy, not too heavy. It's pure fun in its appetite for a good con job and doesn't weather itself down with unnecessary subplots and relationships, although a friendship with these ladies does seem like the joy ride!